Originally a native of Toronto, I migrated north and have lived in the Barrie area since 1971. I retired in 2000 and began to pursue my love of arts. I began by joining the life drawing group at the MacLaren and am still a Tuesday night ?regular?. More recently, I began taking painting classes with John Newton and I am hooked on oils. I am drawn to the environment and my affinity to nature inspires me to paint in order to portray the beauty around me. Capturing a fleeting a time and space on a canvas is the ultimate challenge for me. As a painter, my goal is to capture the essence of the object and present it to the viewer in order to share my experience with the viewer. The act of painting and drawing allows me to interiorize a view, a time, a space whose beauty inspired me. It permits me to create a sense of permanence and revisit what is essentially an ephemeral experience. 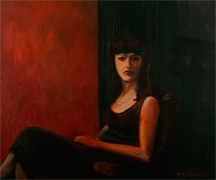 Currently selections of my oil paintings are on exhibit at Markham Theatre, Markham ON until June 25, 2009.